Pulling probably left of a favorable natural site to the fortification, viscounts of Béarn, since the XIè century, established, in the time of their privileged alliance with the Aragon, a strong castle of a rough simplicity,: square tower - the present Mazères tower - of weak height, stretched out building body to the South, palisade enclosing the narrow promontory blocked to the East. 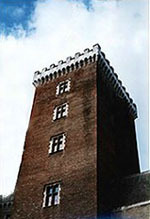 It is the more autonomous development, and turned further toward the Gascon theater and free-English competition aquitain, that incite to amplify and to modernize the feudal whole, with the Montauzer tower (XIIIè century), high dungeon of stones launched toward the North, the Billère tower and especially the retaking, thoroughly, of the fortress by Gaston Fébus (1343 - 1391). 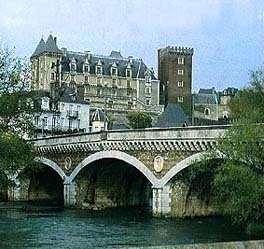 Here the whole of surrounding walls, towers and lodgings developed in an objective of defense bastion are the Bearn, affirms himself like a link essential of the military construction but as economic and politics to which applies the count-sun of a tip to the other of the Pyrenees.